Aim and Objectives: To evaluate the apical fill in relation to apical leakage using three different obturating techniques – Single Cone, Ultrafil 3D, and lateral condensation. Materials and Methods: Sixty-six mandibular single-rooted premolar teeth were selected and were randomly assigned into three different groups of obturating techniques. The canals were prepared using 0.4/25 HyFlex CM (Coltene Endo) rotary system file and obturated with corresponding HyFlex CM Single Cone, Ultrafil 3D injectable technique, and lateral condensation. AH Plus (Dentsply, Detrey) has been used as the sealer. Twenty teeth each were assigned to the three experimental groups, and six teeth were used as positive and negative controls (3 in each group). Fluid filtration technique was used to determine the amount of apical leakage. The evaluation was done for 8 min at the interval of every 2 min. The same teeth were sectioned and a spectroscopic examination was done at 2 mm and 4 mm distance from the apices. The obtained data were statistically analyzed using analysis of variance test followed by post hoc turkeys test for multiple comparisons. Results: The mean apical leakage was maximum for lateral condensation when compared to the Single Cone and Ultrafil 3D. The amount of apical fill at 2 mm and at 4 mm was found to be more in the Single Cone than the other two techniques. Conclusion: The present study concluded that Single Cone obturation technique exhibited more gutta-percha filled area in the canal which led to decreased apical leakage than Ultrafil 3D and lateral condensation techniques, proving to be more effective in achieving a complete three-dimensional apical seal. The success of a nonsurgical root canal treatment is predicted by meticulous cleaning and shaping of canals, complete three-dimensional (3D) obturation, and leakage-free restoration. The anatomy of root canal is varied and complex and this complexity leads to endodontic failures of about 60% due to an apical leakage and a hermitic seal ensures the 3D fit against the apical leakage. Various obturating techniques have been proposed which claim as superior to one another to achieve an excellent apical seal and to eliminate the chances of endodontic failure owing to apical leakage. Schilder states that warm gutta-percha permits a greater density of filling in the apical one-third of the root, but on the contrary, studies reported that lateral condensation showed Both superiority and inferiority., Hence, this study was aimed to evaluate the efficacy of the apical seal of warm gutta-percha (Ultrafil 3D), lateral condensation, and Single Cone technique. A plethora of materials was also introduced, each with having its own unique characteristics, yet the gutta-percha still remains at the forefront of all since its inception into endodontic practice, but it lacks complete bonding to the internal root structure, and hence, the root canal sealant plays an important role. Sealers are used to attain impervious seal between the obturating material and root canal wall. AH plus has been chosen as the sealer in this study, due to its excellent properties, such as low solubility, small expansion, adhesion to dentin, antimicrobial efficacy against Enterococcus faecalisand its very good sealing ability. AH Plus is looked as a benchmark., An essential component that has proven to be a boon to test this efficacy of the apical seal is the fluid filtration technique, giving an exact calibrated measurement that is essential to determine the extent and amount of leakage. Thus, the aim of this in vitro study was to determine the relationship between the amount of sealing capability of gutta-percha and leakage analysis in the apical area among three different obturating techniques, i.e., Single Cone, Ultrafil 3D, and lateral condensation. Freshly extracted sixty-six mandibular single-rooted premolar teeth were collected from Department of OMFS, Navodaya Dental College, and were decoronated at cementoenamel junction using a diamond disc. Ethical clearance obtained from the Ethical Committee of the institution, on June 2, 2017, N with Ref No. NDC/C.E/05/2013-14. The working length was determined using ROOT ZX apex locator (J. MORITA, USA) and the #20 K file. All the teeth were prepared using 0.4/25 HyFlex CM (Colténe-Whaledent, Konstanz, Germany) rotary system file and Glyde File Prep (DENTSPLY) as a lubricant. Interinstrumentation irrigation was done using 3% of sodium hypochlorite and final irrigation was done using normal saline. Group III: Obturated with lateral condensation. The lateral condensation obturation was done with hand spreaders using master cone and accessory cones (n = 20). After completion of the obturation process, excess gutta-percha was removed using a heated instrument and the coronal cavities were sealed using Cavit G. Radiographs were obtained to confirm the obturation and the teeth were stored at room temperature, for 7 days to allow the material set completely. Specimens in the positive (n = 3) and the negative control groups (n = 3) were instrumented in a similar way. The root apices were coated with two coats of nail polish except for the apical 2 mm. The canals in the positive control group were not obturated to allow 100% leakage. The teeth in the negative group were coated with two coats of nail polish completely to ensure that there was no leakage. A modified fluid filtration, analysis was used to determine the apical leakage under the pressure of 20 ml/min. The air bubble was incorporated in the pipette using a syringe and was stabilized at the zero mark [Figure 1]. The corresponding shift of the bubble in pipette was noted after the fluid was released. The measurements were noted for 8 min at the interval of every 2 min, and the values were subsequently recorded in ml/min. After the microleakage analysis, all the specimens were sectioned at 2 mm [Figure 2]a,[Figure 2]b,[Figure 2]c and 4 mm [Figure 3]a,[Figure 3]b,[Figure 3]c length from the apices. The sectioned specimens were examined under the Leica stereomicroscope at ×40 magnification and images were obtained. Adobe Photoshop CS3 10.0 image program software was used for the evaluation of gutta-percha filled area in canal. Then, the data derived were subjected to statistical analysis. The differences in fluid transport between the groups were statistically analyzed with one-way analysis of variance (ANOVA) test followed with post hoc test Tukey's multiple comparisons. The differences in ratios between the three groups at 2 mm and 4 mm from the apex were analyzed using an ANOVA test followed by post hoc test Tukey's multiple comparisons. The level of significance was set at α = 0.05. Data were analyzed using Minitab v14.0. Considering the sample size of 20 in each subgroup and level of significance at 5%, the power of study is 99%. The difference among the three root canal obturation techniques was statistically significant (P < 0.0001). The lateral condensation group showed more leakage than the Single Cone and Ultrafil 3D groups [Table 1]. Comparison of the mean leakage values of three groups showed in [Figure 4]. At the 2-mm level, the Single Cone technique yielded significantly higher gutta-percha-filled area than the Ultrafil 3D and lateral condensation techniques (P < 0.0001) [Figure 5]. 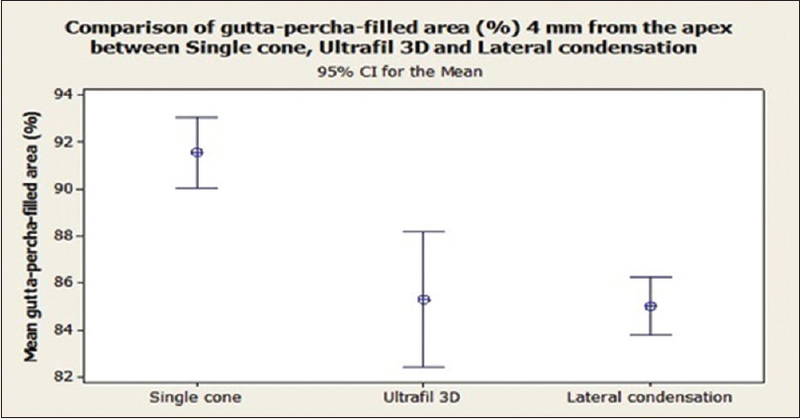 At 4-mm level, the gutta-percha filled area was greater with the Single Cone than Ultrafil 3D and lateral condensation methods (P < 0.0001), but difference between Ultrafil 3D and lateral condensation was not statistically significant (P > 0.05) [Figure 6]. The root canal anatomy is a complex array of many variations. The challenge is to fill the complexities at large. The major objective of endodontic obturation is to completely obliterate and seal the root canal system while maintaining accurate apical control of the filling material. There had been a debate for a decade on quality of obturation and sealing ability using different techniques such as Single Cone, lateral condensation technique, and recently used injectable obturating techniques. The present study considered Single Cone, Ultrafil 3D, and lateral condensation obturation techniques. Single-rooted teeth were used in this study mainly because there would be minimum anatomical variation which would help standardize and thus eliminate the confounding factors. A study performed by Samson E (2013) concluded that the lateral condensation of cold gutta-percha can guarantee a similar seal of canal fillings as can be achieved using thermal methods, in the round canals. The glucose leakage test is a suitable long-term method to evaluate the sealing ability of root canal fillings. Ravanshad S et al. (2004) observed inverse relationship between microleakage and tubular penetration of root canal sealers. Deeper the penetration, lesser is the leakage. Schilder also found that lateral condensation technique tends to give a less homogenous adaptation. We observed that the Single Cone technique gave the best homogenous fill and the least apical leakage compared with lateral condensation. On the contrary, Weller et al. stated that injectable technique demonstrated the best adaptation to the prepared root canal compared with lateral condensation technique. The Ultrafil 3D injectable technique in our study showed moderate adaptability and leakage compared with Single Cone technique and lateral condensation technique. Al-Khafgay et al. concluded from their study that teeth filled with gutta-percha and Adseal sealer using lateral condensation technique showed least apical leakage. Our cross section analysis study revealed that the single cone technique at 2 mm and 4 mm from the apex had the maximum fill than the other two techniques [Table 1] and [Table 2]. Saleh showed that root canal fillings with AH Plus effectively kills E. faecalis in dentin tubules. On the other hand, cytotoxicity of the AH Plus is time limited and is no longer detectable after 4 h of mixing. A number of techniques are available to check the sealing ability of the filling materials such as linear dye leakage, polymicrobial leakage, diaphanization, radioisotope labeling, electrochemical method, and fluid filtration method. The fluid filtration techniques are the most acceptable, and it has been proven to be more sensitive technique which can be reproducible easily. This technique measures the exact volume of the leakage from the specimen through its calibrated scale, but we made sure of its drawbacks such as change of leakage by change in pressure and decrease of leakage over time., Javidi et al. have found this technique to be quite efficient in the evaluation of the microleakage of dental materials through their pilot study. Ismail et al. reported that in the amount of mean, leakage in their study was much less in the Single Cone technique than cold lateral condensation using ProTaper rotary instrument. Tasdemir et al. observed that Single Cone technique gives a greater gutta-percha fill in the apical 2 mm from the apex than the lateral condensation technique. On the contrary, Lieven et al. and Rageshwari et al. found that the quality of obturation with warm gutta-percha was better than the tapered single-cone technique. Further, they added that root canal morphology influences gutta-percha adjustment and the residual fragments on the root canal reduces the sealing ability., Perez Heredic et al. in a study found that there was no statistical difference found between the microleakage among Ultrafil 3D and lateral condensation canals, suggesting that thermal condensation technique was not superior to cold condensation. Laslami et al. (2018) conducted a study to define the relationship between the apical preparation diameter and the apical sealing ability to highlight the importance of the preservation of the diameter and the original position of the apical foramen and they stated as the three different apical preparation sizes showed no statistically significant differences regarding the apical microleakage. However, the most important infiltration was observed in the group prepared with the largest apical diameter. Our study was in agreement with Inan et al. where the mean value of leakage of Single Cone-matched taper gutta-percha was less than that of lateral condensation. We found that the amount of the apical microleakage for the Single Cone technique was less and the gutta-percha in the apical one-third was more than that for lateral condensation and Ultrafil 3D. Peng Li et al. did a meta-analysis of the literature evidence available and concluded that filing is harder to control with warm gutta-percha technique, even though a more uniform mass is obtained, as there is always a possibility of underfilling or overfilling within it. The lateral condensation technique is more economical and less probabilities of overfilling exist, but render a less homogenous mass. In this study, Single Cone technique proved to overcome all the above-mentioned drawbacks of the rest of two obturating methods as being most efficient and does not result in operator fatigue. The present study concluded that Single Cone obturation technique exhibited more gutta-percha filled area in the canal which led to decreased apical leakage than Ultrafil 3D and lateral condensation techniques, proving to be more effective in achieving a complete 3D apical seal. Samson E, Kulkarni S, Kumar SC, Likhitkar M. An in vitro examination and comparison of sealing abilities of 3 different obturating techniques-lateral condensation, obtura II, thermafill. J Int Oral Health 2013;5:35-43. Ravanshad S, Khayat A. An in vitro evaluation of apical seal ability of thermafill obturation versus lateral condensation. J Dent TUMS 2016;1:48-55. Schilder H. Filling root canals in three dimensions. Dent Univ North Am 2015;11:723-44. Weller RN, Kimbrough WF, Anderson RW. A comparison of thermoplastic obturation techniques: Adaptation to the canal walls. J Endod 1997;23:703-6. Al-Khafagy HH, Rehman MM, Noorani TY. Apical leakage of three different obturation techniques. J Pak Dent Assoc 2009;18:5-8. Saleh IM, Ruyter IE, Haapasalo M, Ørstavik D. Survival of Enterococcus faecalis in infected dentinal tubules after root canal filling with different root canal sealers in vitro. Int Endod J 2004;37:193-8. Kardon BP, Kuttler S, Hardigan P, Dorn SO. An in vitro evaluation of the sealing ability of a new root-canal-obturation system. J Endod 2003;29:658-61. Youngson CC, Jones JC, Fox K, Smith IS, Wood DJ, Gale M. A fluid filtration and clearing technique to assess microleakage associated with three dentine bonding systems. J Dent 1999;27:223-33. Javidi M, Naghavi N, Roohani E. Assembling of fluid filtration system for quantative analysis of microleakage in dental materials. Iran Endod J 2008;3:68-72. Sabah A Ismail, Al-Ashou WMO, Al-Askary RA. Evaluation of the Apical Seal in Root Canals Prepared with Rotary Pro Taper Files and Obturated by Different Methods. Al- Rafidian Dent J 2011;11:390-96. Tasdemir T, Yesilyurt C, Ceyhanli KT, Celik D, Er K. Evaluation of apical filling after root canal filling by 2 different techniques. J Can Dent Assoc 2009;75:201a-201d. Robberecht L, Colard T, Claisse-Crinquette A. Qualitative evaluation of two endodontic obturation techniques: Tapered single-cone method versus warm vertical condensation and injection system: An in vitro study. J Oral Sci 2012;54:99-104. Rajeshwari P, Gopikrishna V, Parmeshwaran A, Gupta T, Kandaswamy D.In vitro evaluation of apical micro leakage of thermafil and obtura II heated gutta percha in comparison with cold lateral condensation using fluid filtration system. Endodontology 2005;17:24-31. Perez Heredic M, Gonzalez JC, Luque CMF, Rodriquez MP. Apical seal and comparison of low temperature thermoplasticized and gutta percha technique and lateral condensation with two different master cones. Med Oral Path Oral Cir Bucal 2007;12:E 175-9. Laslami K, Dhoum S, El Harchi A, Benkiran I. Relationship between the apical preparation diameter and the apical seal: An in vitro study. Int J Dent 2018;2018:2327854. Al-Haddad A, Che Ab Aziz ZA. Bioceramic-based root canal sealers: A review. Int J Biomater 2016;2016:9753210. Inan U, Aydin C, Tunca YM, Basak F. In Vitro Evaluation of Matched Taper Single Cone Obturation with a fluid filtration Method. J Can Dent Assoc 2009;75:123a-123c. Peng Li, Ye L, Tan H, Zhou X. Outcome of Root Canal Obturation by Warm Gutta- Percha versus Cold Lateral Condensation: A Meta Analysis. J Endod 2007;33:106-9.